Looking for that perfect souvenir or gift? 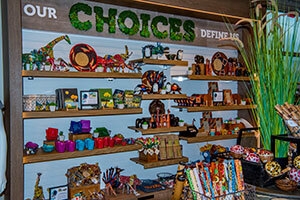 Look no further, Zoo Shop, the newly remodeled gift shop, is now open! The new space has created a better flow and shopping experience for all guests. The rustic elements that will be found in the Zoo Shop represent Wisconsin and can be found throughout the Zoo. One new feature to look for on your next visit is the section called “Our Choices Define Us.” This section features items that are fair-trade, environmentally friendly, and made locally. From gifts to clothing items, this shop has it all! And, love for Wisconsin was not forgotten, as visitors will find some great apparel to show off their Wisconsin pride. Service System Associates (SSA), the Zoo’s concession, merchandise and catering partner, updates and adds new merchandise annually – from books and toys, to apparel and higher-end gifts. The Zoo has two gift shops, with the other located near the Otter Passage Exhibit and offers a selection of otter merchandise, a variety of plush toys and other souvenirs. Both gift shops have that perfect item to take home as a reminder of your visit to the Zoo! Any gift shop purchase helps Milwaukee County Zoo provide exceptional care for animal residents and contributes to the work we do to save animals in Wisconsin and around the world.